Stalking around an apartment that belongs to neither of them, Cobb and the unnamed protagonist of Christopher Nolan’s debut, Following (1998), admire the personal belongings of an unknown person. The protagonist, a man who initially simply enjoyed following people for the sake of adding a bit of excitement to his life, now finds himself in a stranger’s apartment learning how to take his interest in other people to the next level by invading their apartments. He’s there under the tutelage of Cobb, a man who is no stranger to breaking into homes. Cobb, the impromptu mentor, seizes this opportunity to wax poetic about the virtues of stealing someone else’s belongings: “That’s what it’s all about…” Cobb says, “interrupting someone’s life, making them see all the things that they take for granted.” The next day, I made a conscious decision to take a break from drinking for a while. At the time, these two were unrelated though I’ve since come to see a connection. When you make a conscious decision not to do something, it becomes something you have to actively consider especially if it goes against your normal way of thinking. As a result, you are suddenly more aware of the whole thing; it has come to the forefront of your thinking. The day that I decided to take a break, I went to my parents’ place. There, I went to the sauna and as I came out of it, I thought “this is when I would normally have a beer”. Later that same day, we had dinner and I thought “this is when I would normally have wine”. A few days later, I went to play pool with some of my friends at a bar. As I grasped my overpriced coca cola, I contemplated that normally I’d be holding a cool glass of beer or a glass of whiskey. That weekend, I had some friends over for dinner and board games. As we ate and played, I looked at most of my friends drinking alcohol and I thought “normally, I’d be drinking with them”. Normally, I wouldn’t even be thinking about these things but when it became a conscious decision not to drink, I couldn’t help but think about it. I suddenly had to keep making that decision. Usually when I’m drinking, it all happens naturally. There’s not a lot of thought put into it. Almost everyone around me is drinking so it’s not unusual for me to be drinking as well. When I consciously decide not to drink, however, it suddenly becomes something unusual; something that I almost have to justify. During the few weeks that I wasn’t drinking, I encountered quite a few responses to my decision to not drink. I tried not to bring attention to it but almost without fail, there was usually someone who asked me about it. When I explained that I’m taking a break from drinking, sometimes the response was a nonchalant sort of acceptance. Sometimes, however, it was met with an incredulous response and, at the worst of times, it was met with peer pressure to drink. Why is it that I feel like I have to justify not drinking? Why is my “manhood” attacked because I’m not drinking? I suddenly found myself being called a pansy or a wimp just because I’m not getting shitfaced. People that are my friends would question my decision to avoid alcohol and they’d do so in an increasingly aggressive manner. At first, the response would be incredulous, followed by questioning that would be more along the lines of “why aren’t you drinking?” rather than “why did you choose not to drink?”. Do you notice the difference there? The focus would be on why wasn’t I drinking with them rather than asking why I, as a person, did not feel like drinking. There’s a key difference there because one involves insight and understanding while the other involves peer pressure. In the worst case scenario, I’d find my identity being attacked just because I didn’t want to drink. Suddenly, I wasn’t the same person anymore to these people. Our identities are not something that we can control entirely. As the sociologist Zygmunt Bauman professes, identity is not a solid concept but instead a liquid one. What this means is that our identities are forever changing rather than stagnant; like water flowing over our hand rather than a brick that we can grasp. In addition, our identities are often dependent on who we are interacting with. They’re based on what other people see in us. It began to feel that the identity they had created for me was based entirely on drinking and I began to wonder whether that was all we had in common. Suddenly, I would find myself feeling uncomfortable around people that I considered to be my friends. I felt self-conscious about not drinking and I wondered whether their aggressive behavior was a result of them feeling self-conscious about their own drinking. My decision to not drink one particular evening became something that I would have to compensate them for later by drinking far more some other evening. My identity truly was liquid but that liquid was alcohol. What I want to stress here is that this is not an anti-drinking article. In fact, since beginning this article, I’ve already consumed alcohol again. 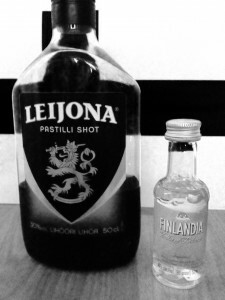 Like many in Finland, I enjoy alcohol. There’s nothing like a nice glass of wine to go with a good meal. I’m not against alcohol. What I’m against is this carelessly casual manner with which alcohol is often treated and, even more so, I’m against this antagonistic peer pressure to drink. Frankly, fully realizing that peer pressure to drink actually exists among adults was disappointing, if unsurprising. Excessive alcohol use is a joke in Finland. I don’t mean that it’s not a serious issue. What I mean is that we joke about it all of the time when it’s something that should be taken more seriously. For me, alcohol can be a source of social and creative energy. It can allow me to experience the world in unique ways. It can also simply be a hell of a way to cut loose sometimes. It’s ok to go nuts every now and then! Sometimes we need to lose control in order to later make sense of this world. At the same time, we can’t ignore the ugly underbelly of alcohol. You don’t have to walk far in Finland before you see a completely and utterly intoxicated person speaking as if they have brain damage. There comes a point when making sense of the world is not simply impossible, but it’s also not even attempted. Honestly, I don’t know what the solution is. I’m against prohibition or censorship. I don’t think getting rid of alcohol will get to the root of the problem. People will find a substitute. However, I do encourage people to generally take a step back from drinking. Try and think about it. My break lasted about a month which, in the grand scheme of things, might not seem like a long time but it is, by far, the longest break I’ve had from alcohol in years. I grant that it wasn’t nearly enough time to have a proper revelation about alcohol but I counter that this thought process is still a work-in-progress. At the very least, it’s a thought process that has finally begun. As for me, I’ll try to think while I drink. Source: Bauman, Zygmunt, and Benedetto Vecchi. Identity: Conversations with Benedetto Vecchi. Cambridge, UK: Polity, 2004. Print.